Since we are on the subject of pinwheels as of late, a few weeks ago we did a custom order for the most fabulous mommy . . . Cam Cooper & her adorable daughter Miss Sofia, and I wanted to give you a look at how wonderful the party turned out! I just adore all of the handmade elements that Cam added into the decor...perhaps you will spot a few lovelies from tutorials past and it makes me oh-so-proud to see Juneberry Lane Custom Printables in action! 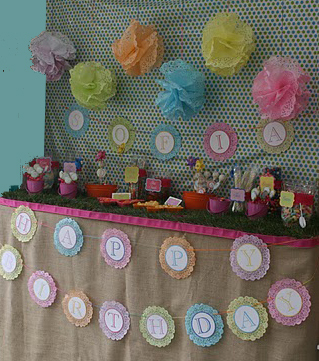 See for yourself what an amazing job she did with this fancy little Pinwheels & Rainbows party . . . Colorful cake pops with our custom labels . . .
Candy Jar Labels for some sweet snacks . . . Remember our lovely hand-dyed lace doilies? Custom Pinwheel Straw Flags . . .
Ushering the guests in with style . . . The gorgeous mommy & baby girl . . .
Miss Sofia in action . . . Thank you to the lovely Cam & Sofia for sharing their special day with us! Have a party coming up and looking for your own set of printables? Just visit our Etsy shop and send me a message and we'll get started designing your very own line of custom party supplies . . .
A Dream Home Tour: Part 2 . . .
Red & Blue Picnic: An American Affair . . .
A Dream Home Tour: Part One . . .
Tutorial Tuesday: DIY Drink Umbrellas . . .
Juneberry Baby: 'Tea Time Baby Shower' . . . Champagne Soirée Invitations & Labels . . .
Tutorial Tuesday: DIY Vintage Photo booth . . .
Part 2: Prettiest Shops on the Planet . . .
A Surprise Engagement Story . . .